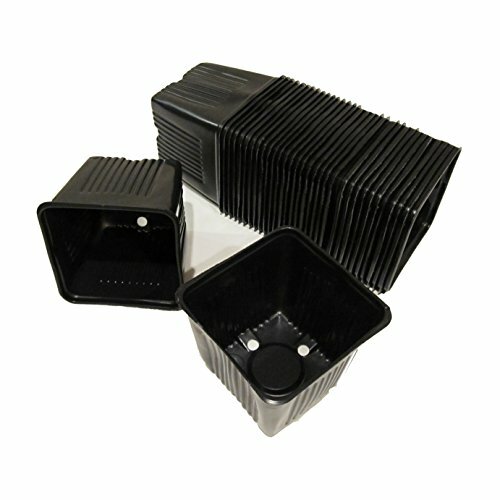 Get a jump on the growing season with this value pack of of 50 commercial-grade black plastic nursery pots. Pots measure 4" in width (measured at the widest point, across the top rim) and are 3-1/2" deep. Constructed of molded UV-resistant plastic, these containers are lightweight and pliable, yet durable enough to be used season after season. Ideal for all-purpose greenhouse use, including plant propagation and transplanting of vegetable and flower seedlings. Made in the U.S.A.; bulk packaged and shrink wrapped by vendor for sale on Amazon. A note about sizing: Gage Durapots are true 4-inch pots, substantially larger than the 3-1/2-inch pots which are designed fit 18 to a standard 10x20 mesh tray. If you are intending to use these pots with trays, please measure your tray first to insure a proper fit. Alternatively, please consider the 3-1/2-inch Gage Durapot, also available from Amazon under ASIN B00W056SKE (quantity 25) and ASIN B00VZF4OWY (quantity 50). If you have any questions about this product by Gage, contact us by completing and submitting the form below. If you are looking for a specif part number, please include it with your message.